Dominique Fabre is a contemporary French novelist whose work focuses on the lives of individuals on the fringes of society, ordinary people just trying to get by as best they can. 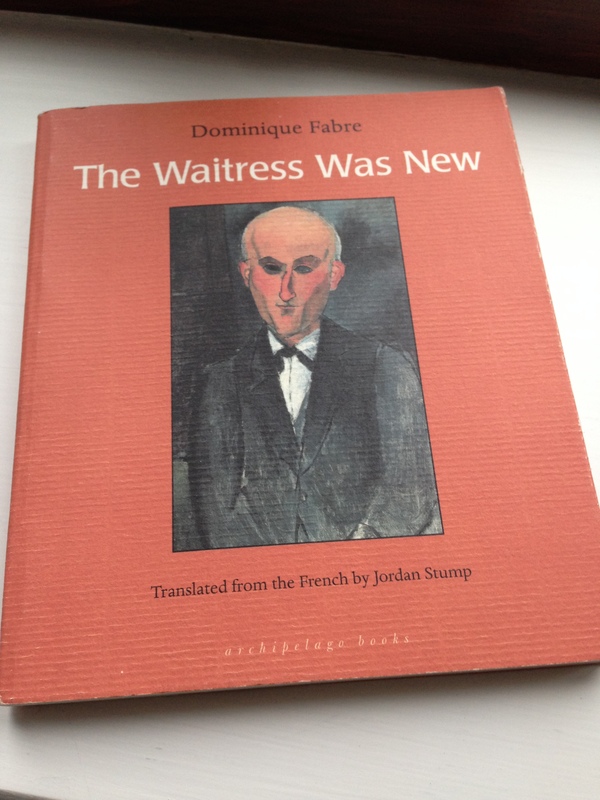 First published in France in 2005, The Waitress Was New was the first of his books to be translated into English. The novella is narrated by Pierre, a fifty-six-year-old barman who works in Le Cercle, a café-bar in the Hauts-du-Seine suburbs of Paris. We follow Pierre over the course of a few days as he works at Le Cercle, going about his business and tending to customers as they pass through the café. Pierre is a seasoned veteran, a career bartender. He has worked in bars across the Hauts-du-Seine département for most of his working life. Le Cercle has been his home-from-home for the past eight years. As such, he is sensitive, diplomatic and discreet when dealing with customers, always willing to lend an ear when someone wants to talk or offload about their lives. Equally, he seems to know instinctively when someone wants to be left in peace. Perhaps most importantly of all, he takes care never to keep a customer waiting for their bill when they’re ready to go – after all, his customers have their own lives to lead. During the course of the novella, we see some of Pierre’s regulars, the people who flit in and out of his life on a frequent basis. Here’s one of those people, a woman who comes to the café most mornings. I couldn’t help but wonder about her life, perhaps Pierre does too. A few things happen while we are in the company of Pierre. The café’s boss, Henri, a married man in his early forties, disappears, leaving Pierre, the new waitress, Madeleine, and the cook, Amédée, to run the place in his absence. Le Cercle’s regular waitress, Sabrina, has called in sick, and there are rumours that she is having an affair with Henri…at least that seems to be the assumption. The boss’s wife, Isabelle, lives in an apartment above the restaurant, and so she draws on Pierre for a little moral support and reassurance now and again. There’s a bit more to it than that, but I’ll leave you to discover the rest for yourselves should you decide to read the book. The Waitress is not a plot-driven novel; instead, the focus is on Pierre’s interior life, his thoughts and reflections, his concerns and expectations for the future. At various points in the book, Pierre touches on events in his past, and so we get to hear a little of his backstory. Many years ago, Pierre was married, but it didn’t work out; now he seems resigned to life as a bachelor, reasonably content to live alone, a situation that appears to suit him best. Here’s Pierre as he thinks back to his last girlfriend, Jacqueline, whom he broke up with some three years ago. The Waitress Was New is a quiet, introspective novella. Fabre perfectly captures the sense of dignity and humanity in Pierre’s character as he goes about his day-to-day life. The tone is melancholy, especially in the passages where Pierre reflects on the loneliness and uncertainty that can come as one gets older. For such a slim book – 110 pages in total – I found The Waitress surprisingly moving. It’s a story that would suit lovers of low-key, understated, character-driven fiction. A little gem. I first read about Dominque Fabre on Guy’s blog, where you’ll find his review of this book together with a post on another of the author’s novels, Guys Like Me. The Waitress Was New is published by Archipelago Books. Source: personal copy. This entry was posted in Book Reviews, Fabre Dominique and tagged #TranslationThurs, Archipelago Books, Book Review, Dominique Fabre, Fiction, France, Jordan Stump, Literature in Translation, Novella on February 28, 2016 by JacquiWine.